I do check the obituaries to see if any friends have died, like old people do. I do water my juice down so it’s not so strong, like old people do. I occasionally misplace things in dumb places, like old people do. 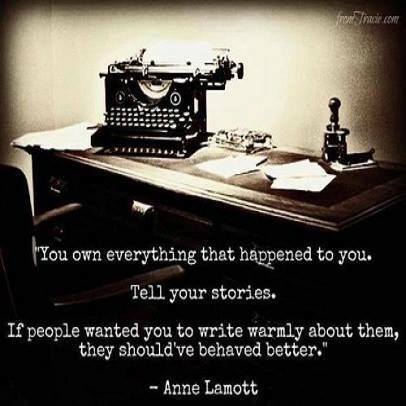 I do say what I think without worrying what people will think of me, like old people do. I do many things that old people do. But I refuse to be the old lady with the cats. I got rid of the cats. All of them. It started as my readers will know with me going to the pet store with my friend Texas Linda. I admired a turquoise Betta Fish a woman was holding. Said it matched my bedroom. She gave me the fish and said she insisted I take it. She would pick another. I was too embarrassed to just put it back … and I bought him. Shortly after that, I was at the same store. I was not feeling great. Never pick a fish when you are not feeling great. Linda suggested a brown one would match my Living Room … and I bought him. Whats a Bert without an Ernie? And I really wanted a red Betta when I got Bert. So next time I was in the pet store, I saw a Crowntail Betta … and I bought him. I have stopped at three fish. I don’t think I qualify as the crazy lady with the fish … yet. But Linda … my friend Texas Linda … I’m a little worried about her. About the same time I was looking at Fred … she was eyeing the huge tank of Feeder Fish … goldfish … you know, the ones that are used as food for larger animals. And she felt sorry for them. So as I was heading to the register to buy Fred, she came up behind me with a goldfish bag … containing two tiny goldfish. She thought it would be great fun to name them after submarines she knew well … and named them Wahoo and Flasher. Next time she rescued a larger one … Queenfish. 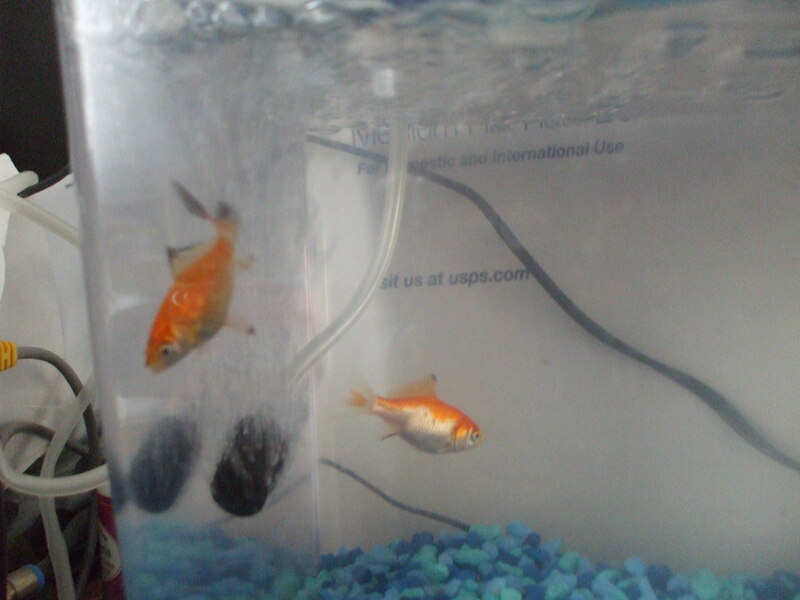 And bought all three a nice three gallon goldfish bowl. Not sure if its Wahoo or Flasher who has his reflection on the right in the picture. Until she decided to rescue another Goldfish … feeder fish again. This one just sat at the bottom of the old fishbowl for several days … except when food was put in the bowl. Then he instantly came to life … gobbled all the food quickly … and retired to the bottom of the bowl for another day. I don’t think Sluggo is a submarine. On adding Sluggo to the three gallon tank, he suddenly came to life and swam with gusto … actually he swam mostly with Queenfish. And although the water started to need changed every other day, all was well in Fish Land. Linda decided to get the Goldfish some treats. And what constitutes a treat for a Goldfish? Turns out its shrimp … flakes of shrimp. Now call me a cynic, but isn’t this a little like the Pig in Pearls Before Swine who likes eating Bacon, Lettuce and Tomato sandwiches? “The container says you should feed the goldfish the shrimp flakes no more than three times a week.” said Linda. I wonder how the Mommy Goldfish handle this in the wild? Since all four were spending lots of time at the top of the tank … something needed to be done for the Fish Rescue Mission. Enter a Bubble Aerator. Pumps air into the water. 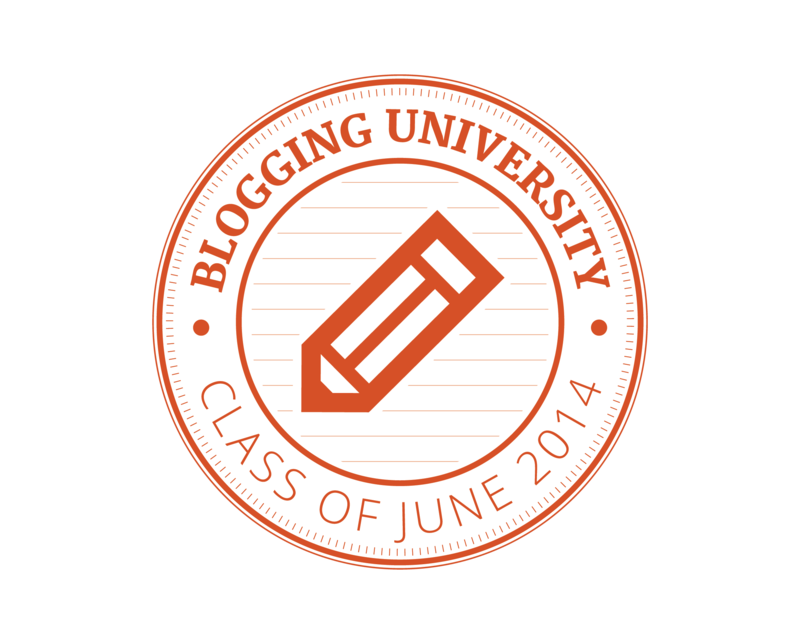 Do you know what happens when you are a very little goldfish and you swim over the bubble maker? Besides the fact that they were flipped end over end. Suffice it to say this is their newest best friend. They swim through it repeatedly. With a smile on their face. Well, it looks like a smile. But the water was needing changed every other day … and that gets old no matter how devoted you are to the Fish Rescue Mission. Enter a new five-gallon Aquarium … complete with light and electric filter. 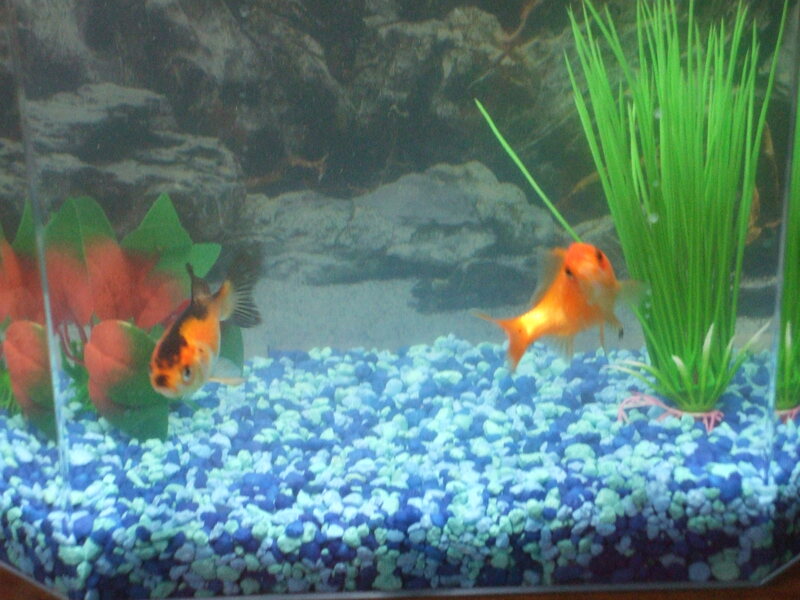 So Sluggo and Queenfish got a new home … after all they are the big ones. And the little guys are left to their own devices with the bubble machine. Is that a smile on Queenfish’s face? Or is she just posing for the camera? At any rate, when we talked today, I mentioned how I had gotten the “put in the tank dissolve for seven days” fish food. I had gotten them thinking I’d need them next week when I travelled out-of-town. Turned out it was a good thing I had them this week when an emergency came up. Linda decided she needs to get long-term feeders for her Goldfish Rescue Mission. Never can be too prepared after all. Oh, and did I want to tag along the next time she goes to the pet store? 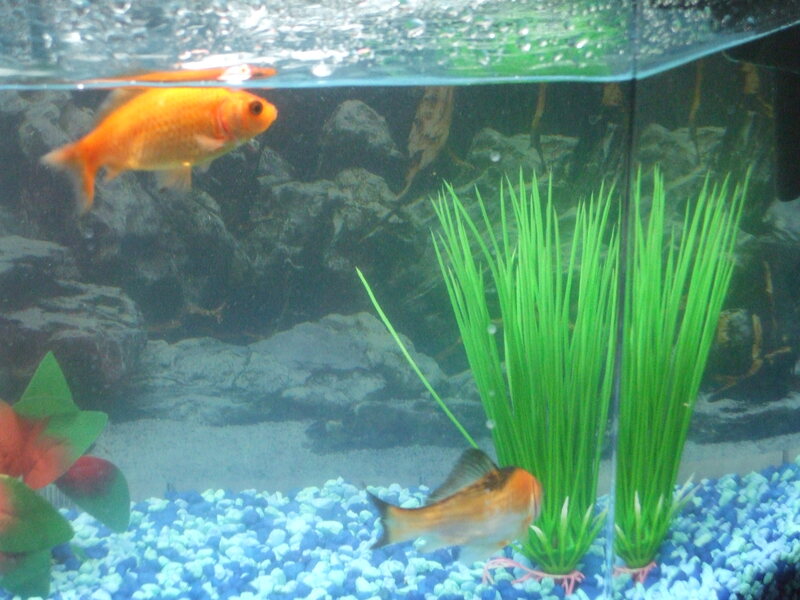 There is room in the tank with the large fish to rescue one more large Goldfish … feeder fish. And room for at least two more little ones to be rescued for the smaller tank. How many fish do you need to have to qualify as an official Fish Rescue Mission? Or to be the crazy lady with the fish? 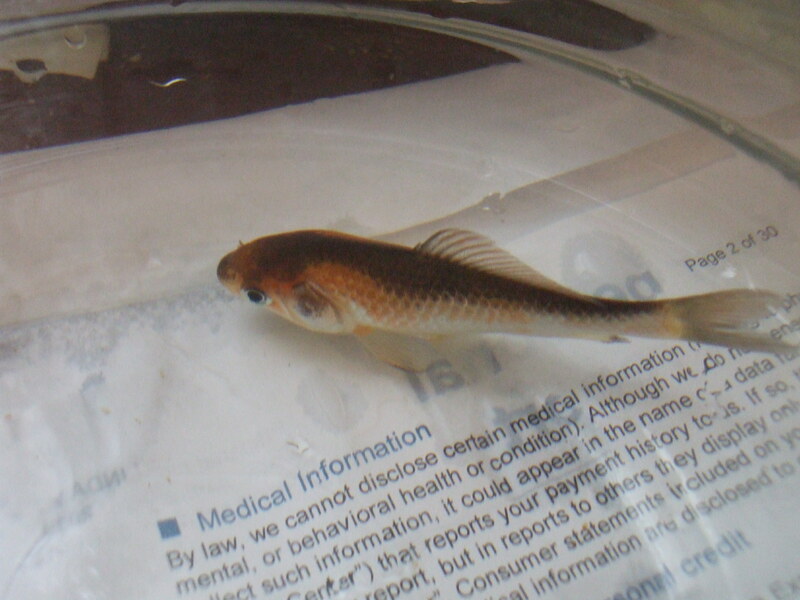 I have a goldfish that I rescued. My neighbor left it in a bowl after she moved. It was just a wee little fish. However now it is a rather large goldfish somewhere between six and eight inches. It is outgrowing our 20 gallon tank. We’re trying to downsize so we don’t want to get a bigger tank. Very nice goldfish would you like him. He’s fancy in flowing and loves to eat goldfish crisps. I hope to hear from you. Thanks PS I used to be the cat lady recently lost at 21 year old and a 22 year old cat. The bigger the tank, the bigger the goldfish! And as you said there are many different types of fancy goldfish as well. My friend Linda (of this post’s fame) ended up with two tanks, five fish and they lived until recently. FWIW the tanks each had heaters and filters. And I guess my ‘cat lady’ status is back. I got one two months ago … and so as not to have a lonely cat if I wasn’t around I got a second one. But I’m not getting a third one. No way. She said. Interesting. Not too many folks are willing to get a 50 gallon tank for two or three goldfish. I think just the fact that as feeder fish they were destined to be eaten for dinner by whatever eats them, and were lucky to be taken in by my friend. 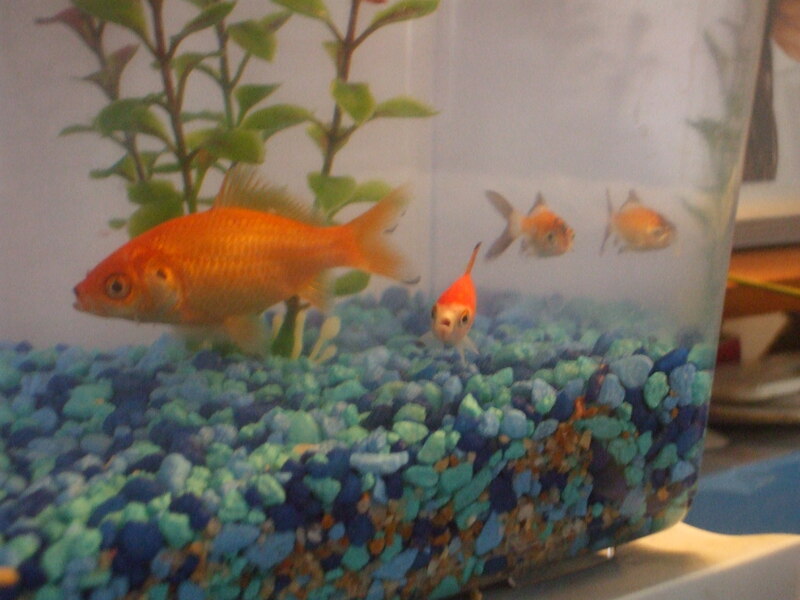 Goldfish will grow to whatever size you give them. A 50 gallon tank would grow carp sized fish. Oh, and the two tanks she ended up with both had lights, heaters, and filters.